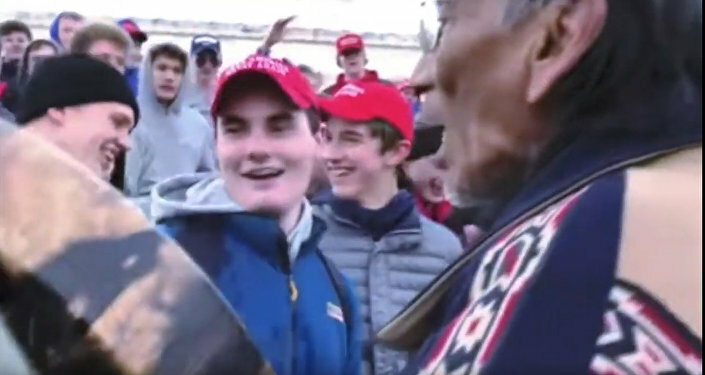 The standoff between boys from the Covington Catholic High School and a Native American elder outside the Lincoln Memorial in Washington DC hit the headlines last weekend. 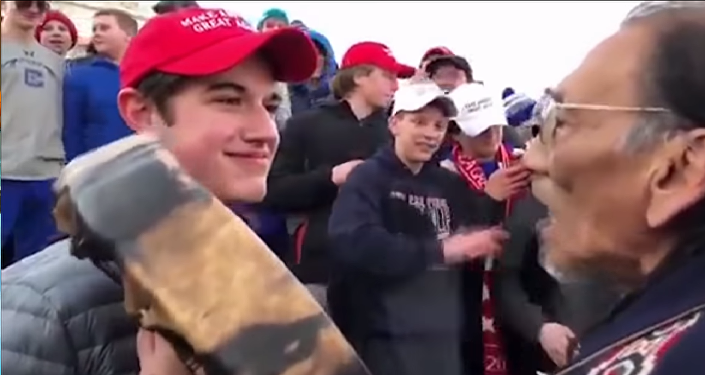 MAGA hat-wearing teenager Nick Sandmann has said he had every right to stand before a Native American elder, adding that he believed his actions were not disrespectful. While mainstream media outlets were quick to condemn the students wearing MAGA hats, it turned out they reacted to verbal abuse by the Native American elder, who had been described as a "Vietnam War veteran," an assumption which has later been proven false. Sputnik has discussed the mainstream media’s reaction to the incident with Richard Vatz, a distinguished professor of Rhetoric and Communication at Towson University. Richard Vatz: I think we’ve got what we would consider an era of new journalism where the major criterion is to be the first to print, or the first to report. And when that is your major measure of success, you don’t take the time to find out the context. So, when a very short-period video is shown you very often will go with that without taking the time to research exactly what the context is. I think that’s very unfortunate, but that’s the world we’re in. Sputnik: You’ve not really mentioned the correlation that the other American commentators are stating and that’s the situation by American […] who’s stating that it’s not judgements, that he’s just been alluding to what happened because there are many people [who are] desperate to get rid of Donald Trump. What’s your take on that? Richard Vatz: I think that’s true. I think you’re referring to the now famous remark by Joy Behar on the show The View. She is kind of an ingenuous liberal and Whoopy Goldberg asked her why so many mistakes are made and she said “because we’re desperate to get Trump out of office”. Her appeal is that she is often honest as opposed to being sneaky; so, she’ll always say the truth, and she is a little bit like a child. I think that she is correct; I think that that is the motive; that you have so many media who are bound determined as part of what’s called the resistance. The resistance is a philosophy wherein normally disinterested sources are now part of the movement to rid the country of Donald Trump by impeachment or other methods. And this is often their motive in reporting. It’s kind of transformed the credibility of American journalism, which used to be a little bit on the left and now has become so virulently anti-Trump that there is very little attempt to be fair and disinterested in the reporting anymore. Sputnik: What’s your particular take on this? There’s obviously a lot of hot air being circumnavigated over this particular situation. Who is at fault here? Is it the boy himself, or does the elder takes some blame, or is it basically both parties, there’s no particular winner with both of them acting inappropriately? What’s your take? Richard Vatz: I really don’t see this as the sides are equally to blame. These are high-school juniors who were reacting to some protest that thought were very aggressive. And I think that the fact is that Nathan Phillips, the Native American, approached them and they were reacting to his aggressiveness. And he is all over the place – he makes statements that they were attacking black people and they were in a process of attacking four black individuals, and that was false. Nathan Phillips strikes me as a publicity seeker, and an irresponsible one at that. You also had at the time this group called the Black Hebrew Israelites who are described by the Southern Poverty Law Centre, which is a left-wing but very good group of people, as a radical movement that is growing more militant. I mean these are 16 and 17-year-old boys and they were acting as responsibly as you can expect 16 and 17-year-old boys to act, and they were provoked. Sputnik: Shakespeare wrote a play ‘Much Ado about Nothing’, I mean that’s what this story is consuming. The ex-mayor of London, Ken Livingstone, a couple of months ago wrote an article about the American political scene saying that it’s very much a broken political machine; and that sort of seems to attract people’s rationale when they’re talking about that. What’s your particular point of view on the wider point of view regarding this kind of story about the American political machine? Is it broken with regard to the current malaise, these troubles that you’re having with this constant pointing a finger between the Democrats and the Republicans? Obviously, it’s going a lot deeper than that, but what is the general consensus about the political machine by a normal American citizen? Are they very much disturbed by what’s going on? Richard Vatz: I don’t think that the American political system is broken. I think that you have a system which is actually working quite well with its checks and balances. What you do have is that the principal personalities in this system have become polarized; and consequently there’s no more fairness. You have the media, for example, you have the CNN which used to be a left-of-centre, but well-respected news organization, and now they’ve become part of what’s called the resistance which I referenced earlier, which is that they view their job as to bring Trump down and that should not be the job of journalism. And so you have people like, Wolf Blitzer, who used to be very well-respected, now asking questions about Donald Trump and calling him a liar; and news people should have a little bit more professionalism when they call principals liars.